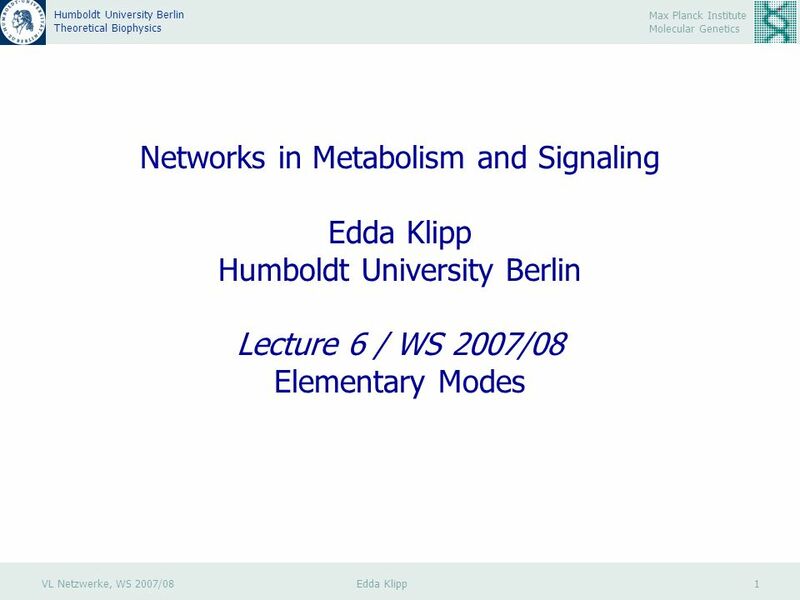 11 VL Netzwerke, WS 2007/08 Edda Klipp 11 Max Planck Institute Molecular Genetics Humboldt University Berlin Theoretical Biophysics Schusters Algorithm 1. 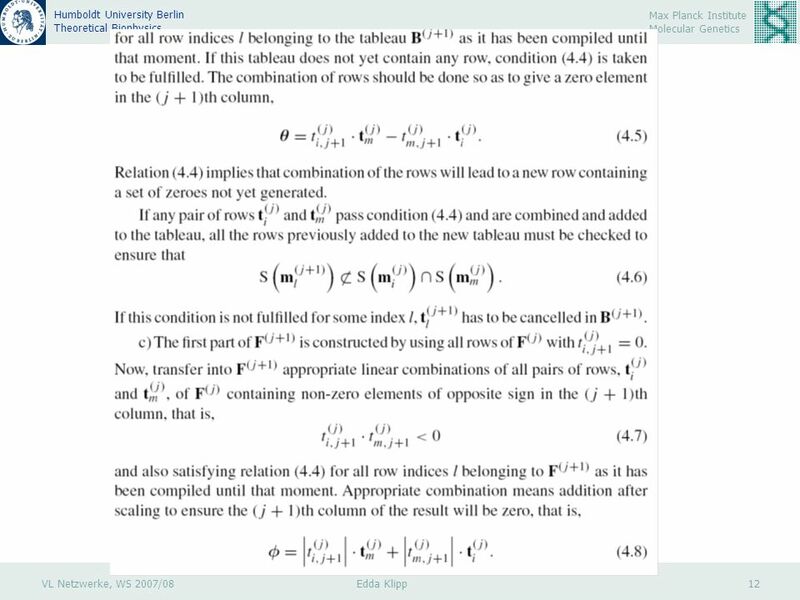 Start with the tableau I for book-keeping or Schuster, S. et al, 2002, J Math Biol, 45, 153-181. 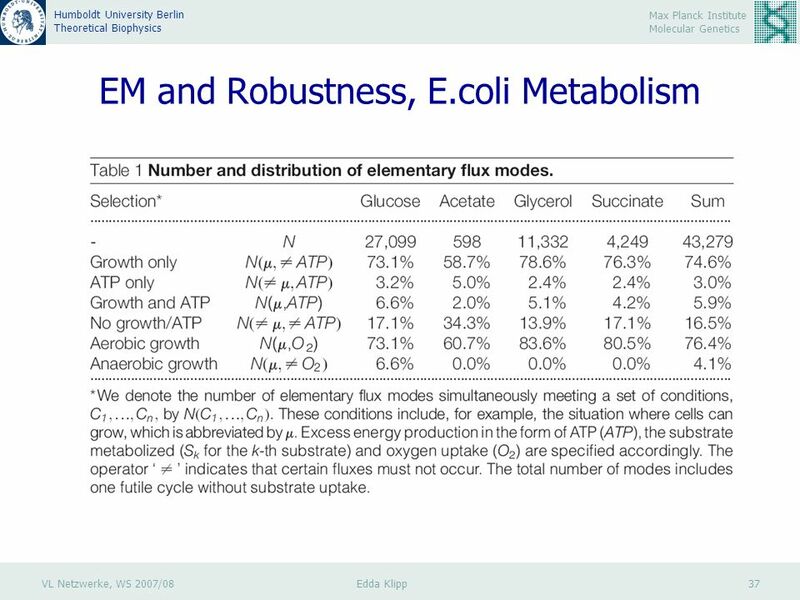 31 VL Netzwerke, WS 2007/08 Edda Klipp 31 Max Planck Institute Molecular Genetics Humboldt University Berlin Theoretical Biophysics EM Producing ATP from Adenine The ATP glucose yields (that is, the ratios of ATP production over glucose consumption fluxes) of modes II.1-II.4 are 2 : 7, 1 : 6, 1 : 4 and 3 : 10, respectively. 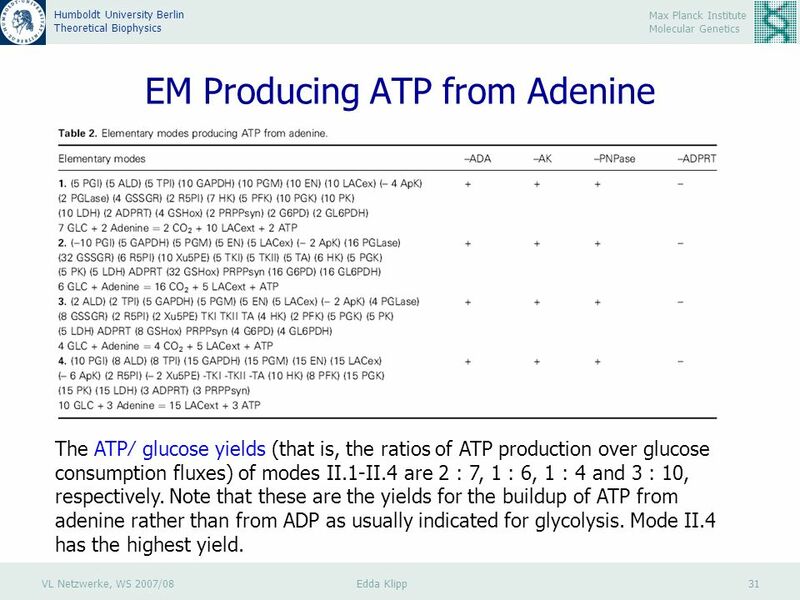 Note that these are the yields for the buildup of ATP from adenine rather than from ADP as usually indicated for glycolysis. 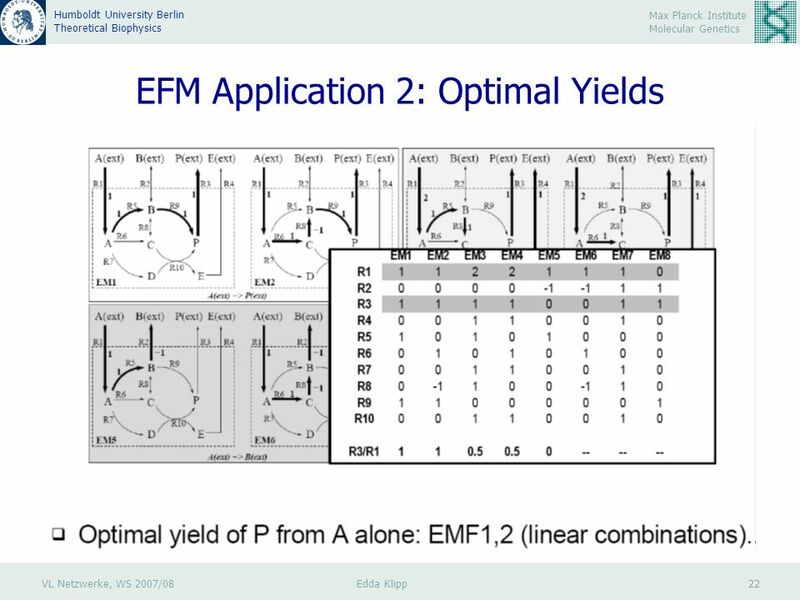 Mode II.4 has the highest yield. 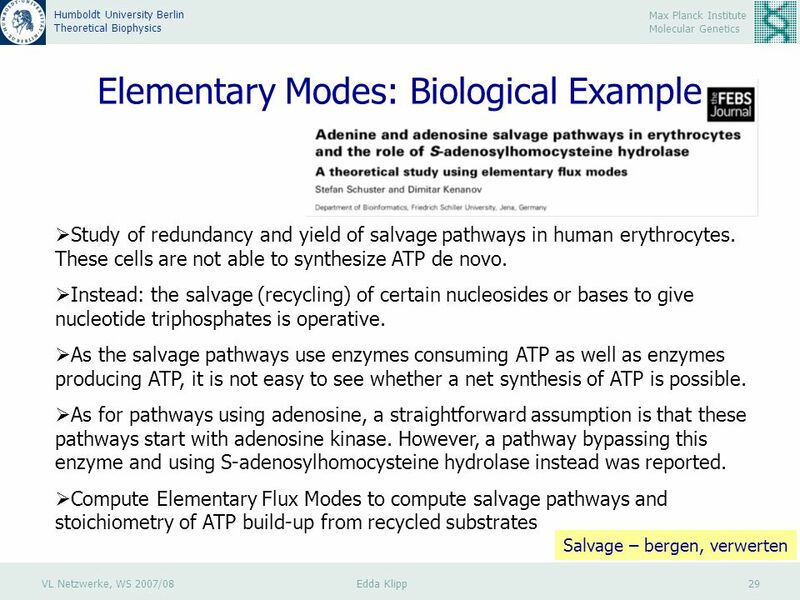 32 VL Netzwerke, WS 2007/08 Edda Klipp 32 Max Planck Institute Molecular Genetics Humboldt University Berlin Theoretical Biophysics EM producing ATP from Adenosine The ATP adenosine yields of the ATP-producing modes are 1 for modes III.1-III.3, 1 : 4, 2 : 5, 1 : 4, 1 : 4, 8 : 17, 5 : 14, 2 : 3, 1 : 4 and 5 : 8 for modes III.4-III.12, respectively. 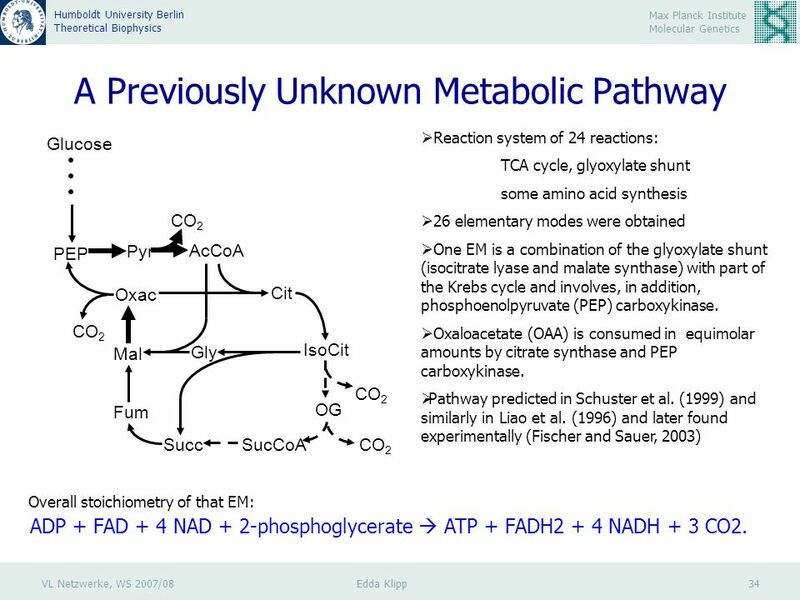 Thus, modes starting from glucose and adenosine transform the latter completely into ATP, which implies that glucose is the only energy source. 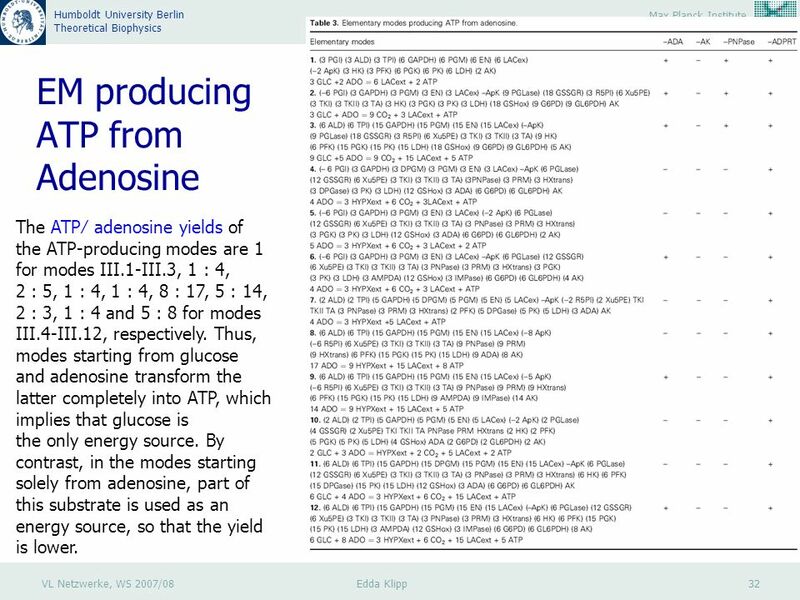 By contrast, in the modes starting solely from adenosine, part of this substrate is used as an energy source, so that the yield is lower. 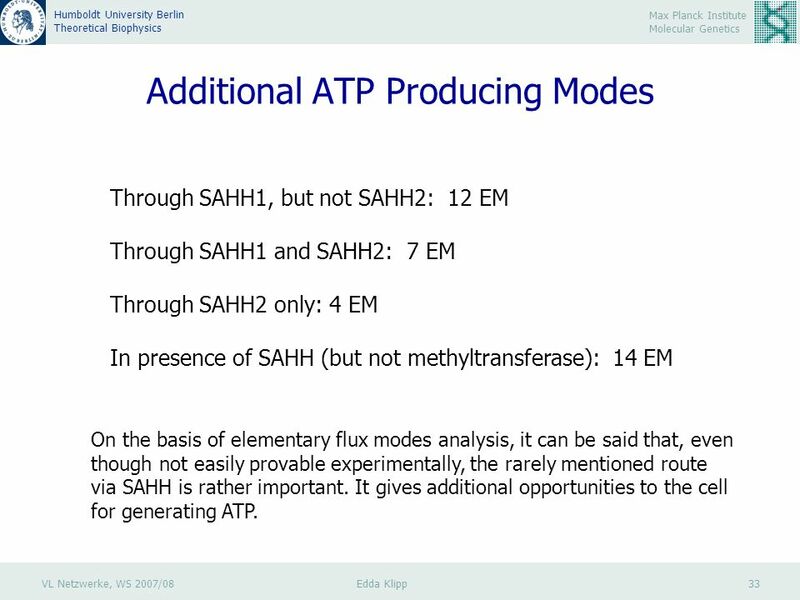 33 VL Netzwerke, WS 2007/08 Edda Klipp 33 Max Planck Institute Molecular Genetics Humboldt University Berlin Theoretical Biophysics Additional ATP Producing Modes Through SAHH1, but not SAHH2: 12 EM Through SAHH1 and SAHH2: 7 EM Through SAHH2 only: 4 EM In presence of SAHH (but not methyltransferase): 14 EM On the basis of elementary flux modes analysis, it can be said that, even though not easily provable experimentally, the rarely mentioned route via SAHH is rather important. 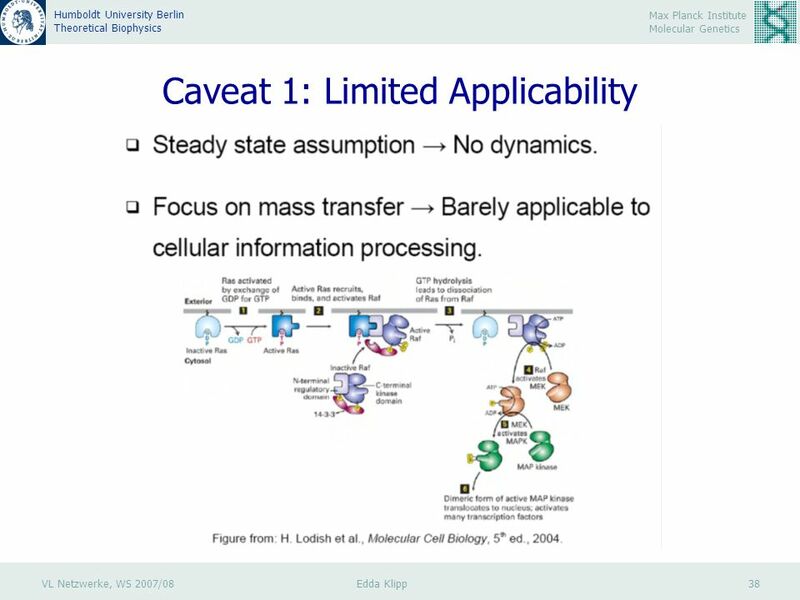 It gives additional opportunities to the cell for generating ATP. 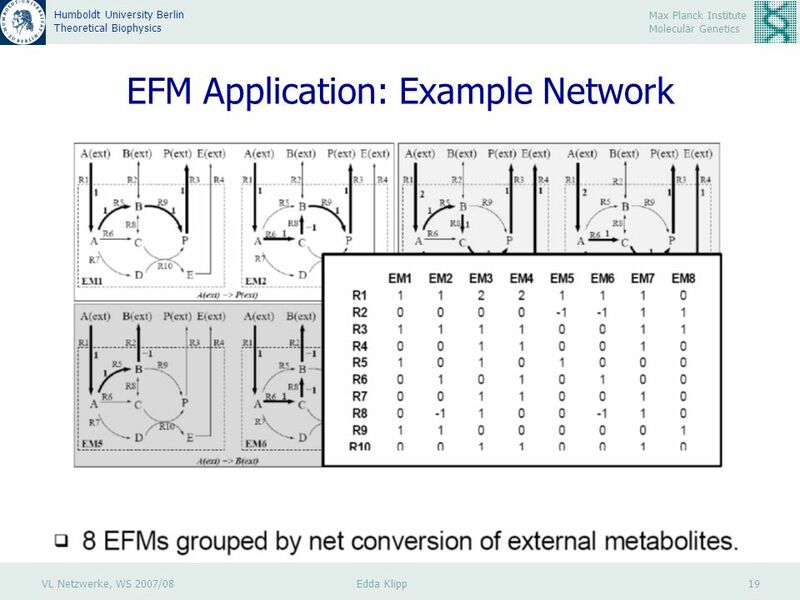 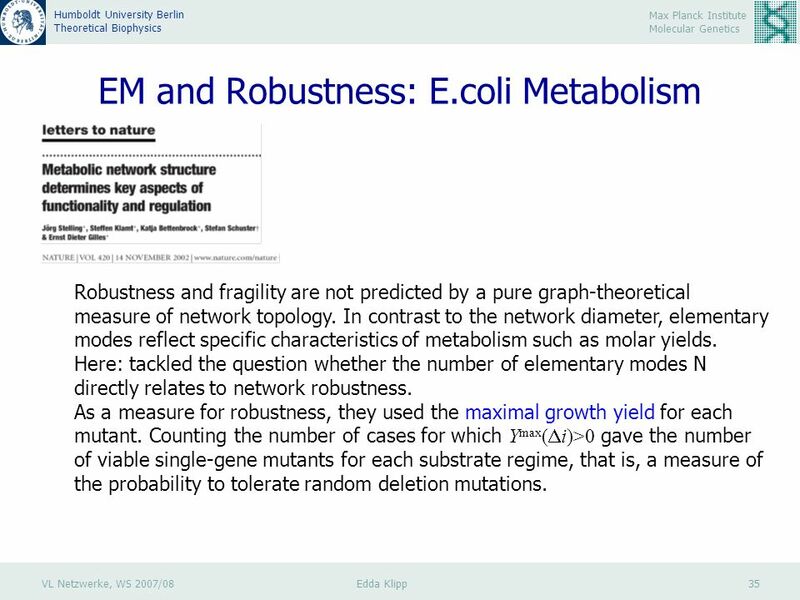 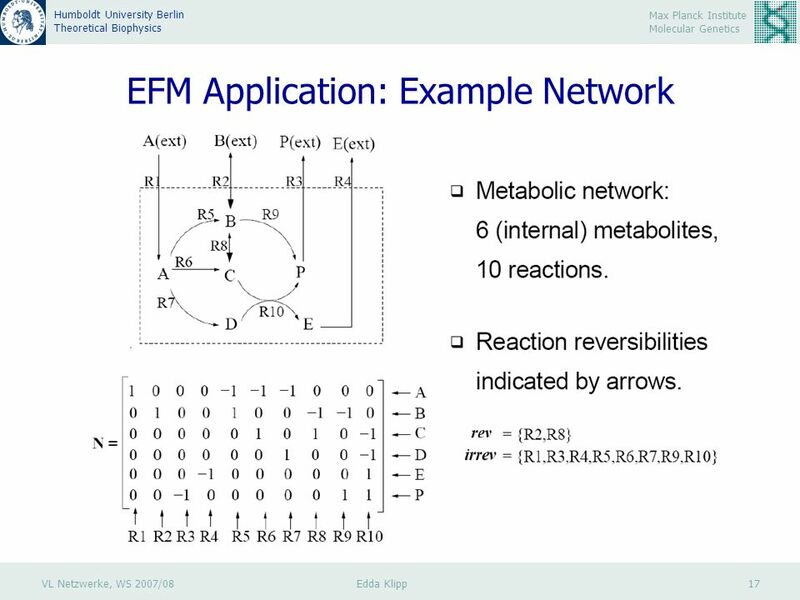 35 VL Netzwerke, WS 2007/08 Edda Klipp 35 Max Planck Institute Molecular Genetics Humboldt University Berlin Theoretical Biophysics EM and Robustness: E.coli Metabolism Robustness and fragility are not predicted by a pure graph-theoretical measure of network topology. 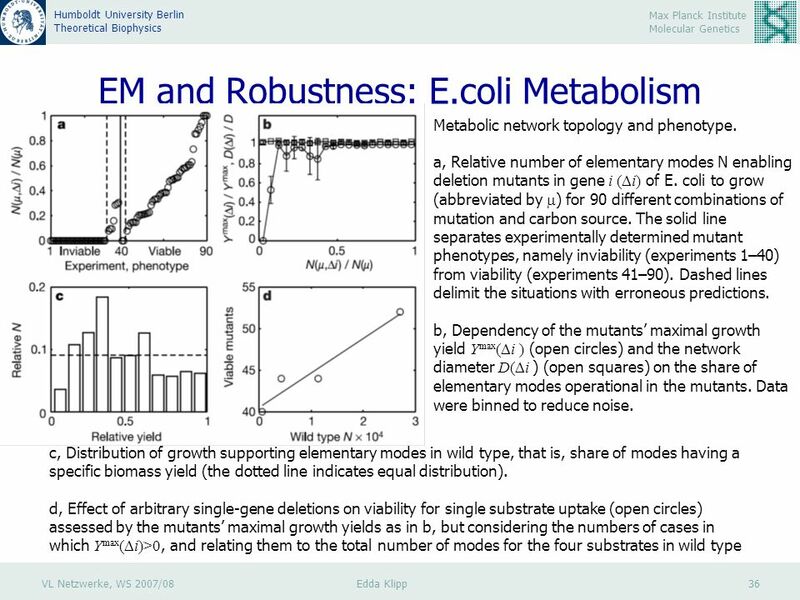 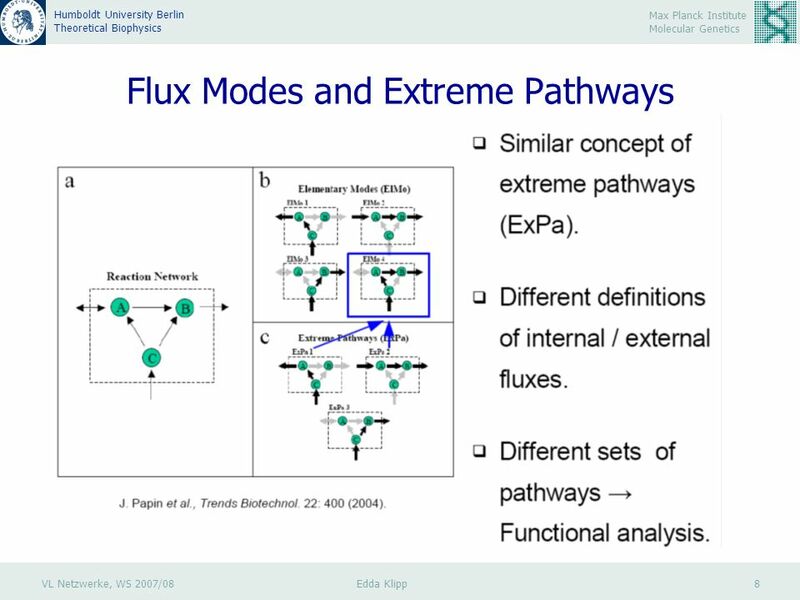 In contrast to the network diameter, elementary modes reflect specific characteristics of metabolism such as molar yields. 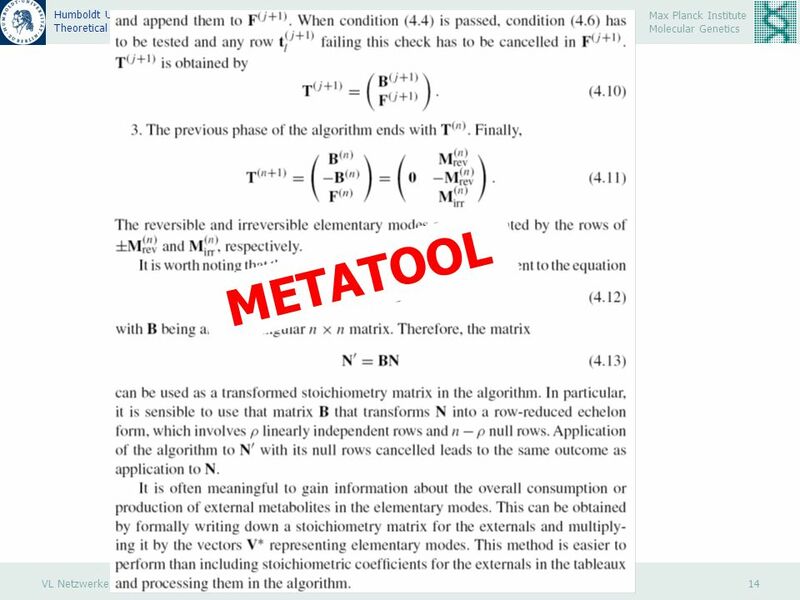 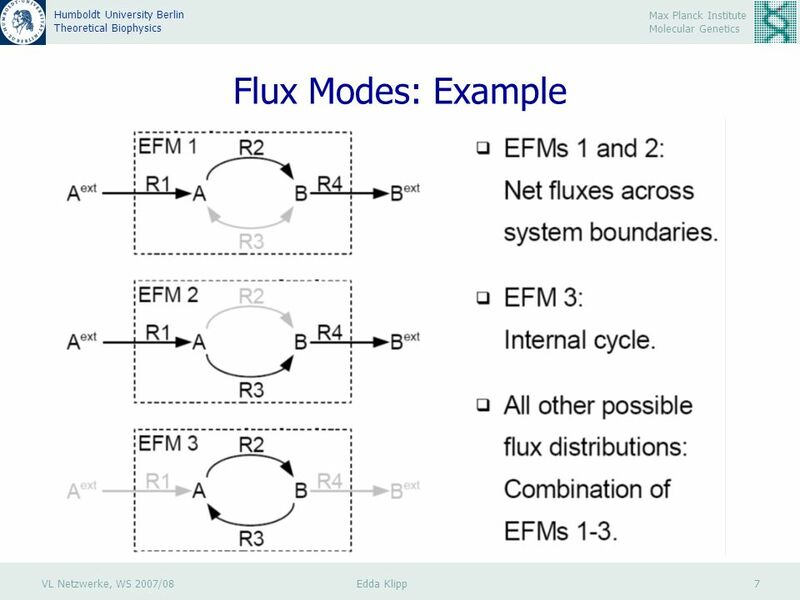 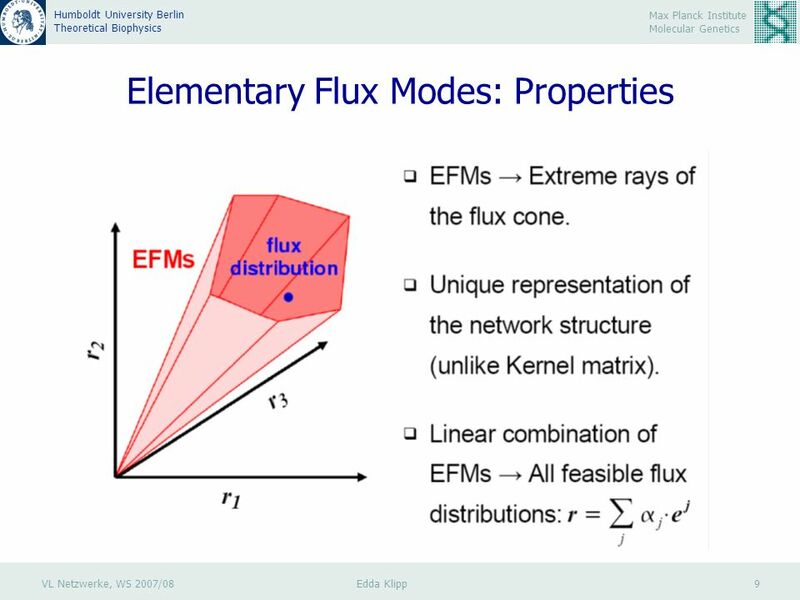 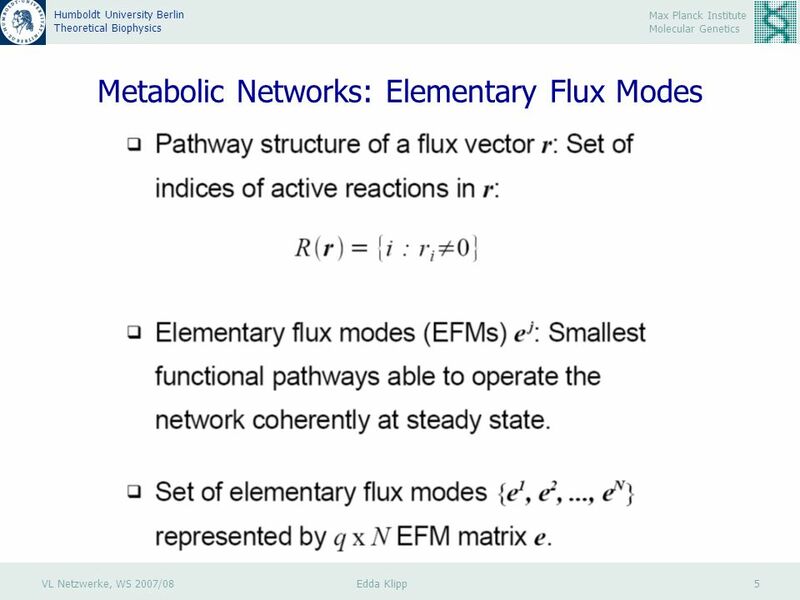 Here: tackled the question whether the number of elementary modes N directly relates to network robustness. 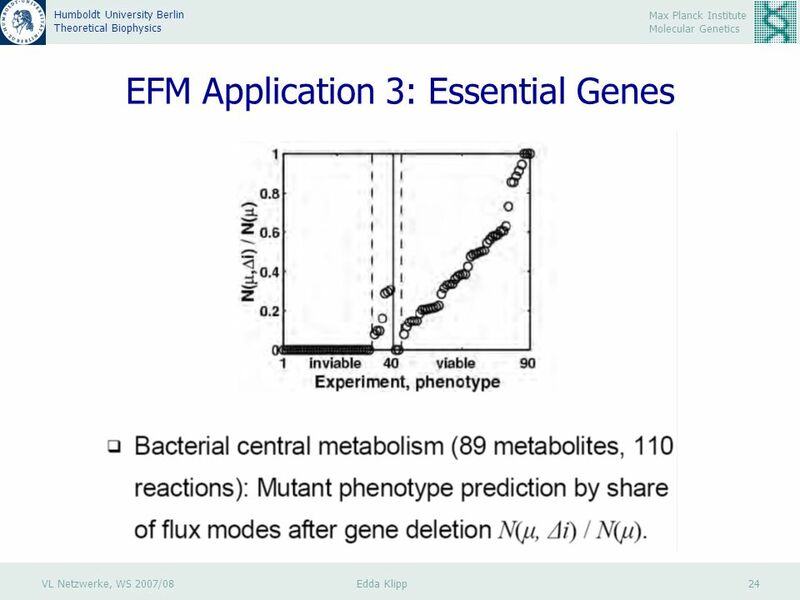 As a measure for robustness, they used the maximal growth yield for each mutant. 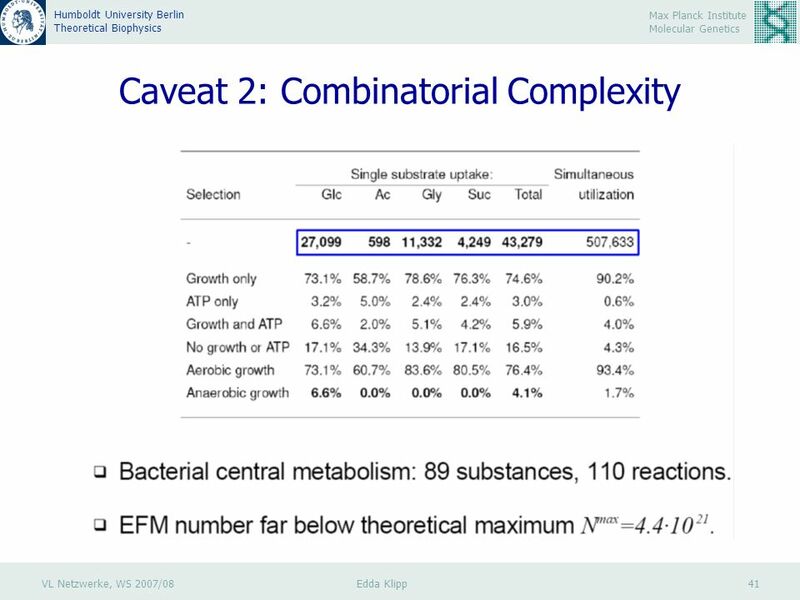 Counting the number of cases for which Y max ( i)>0 gave the number of viable single-gene mutants for each substrate regime, that is, a measure of the probability to tolerate random deletion mutations. 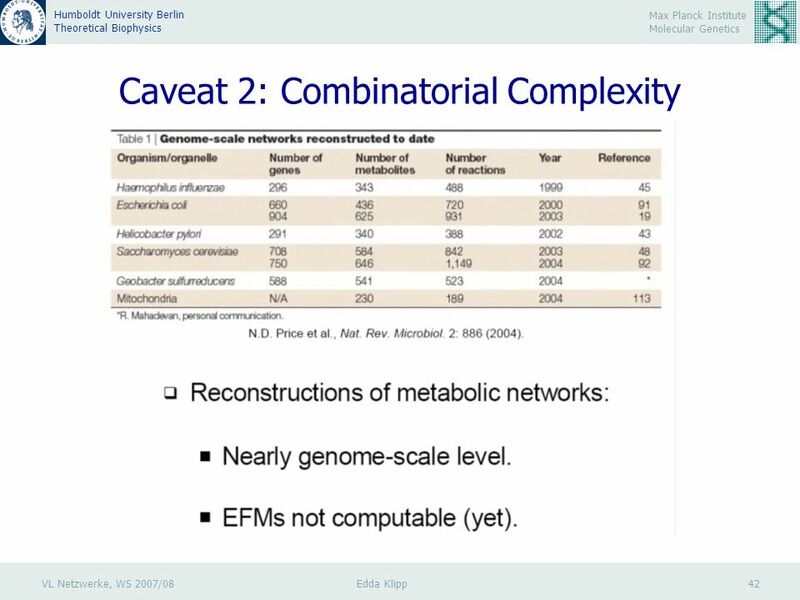 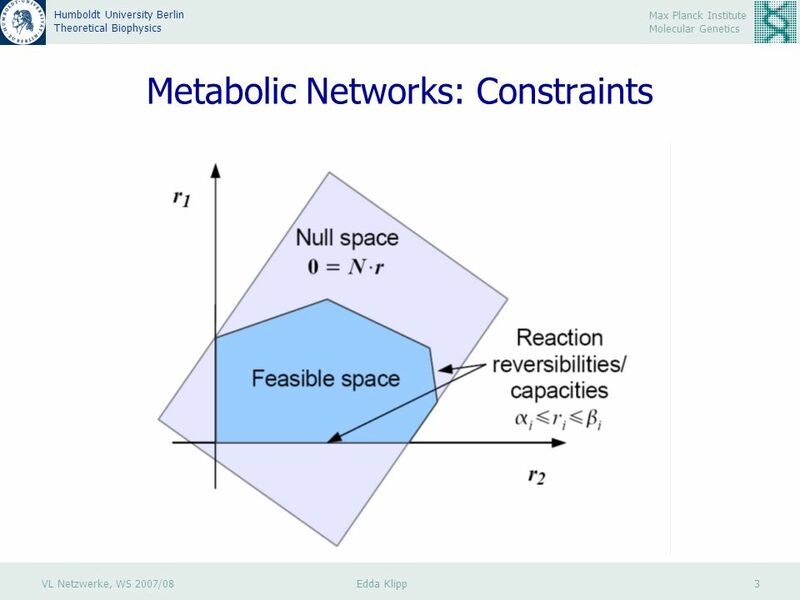 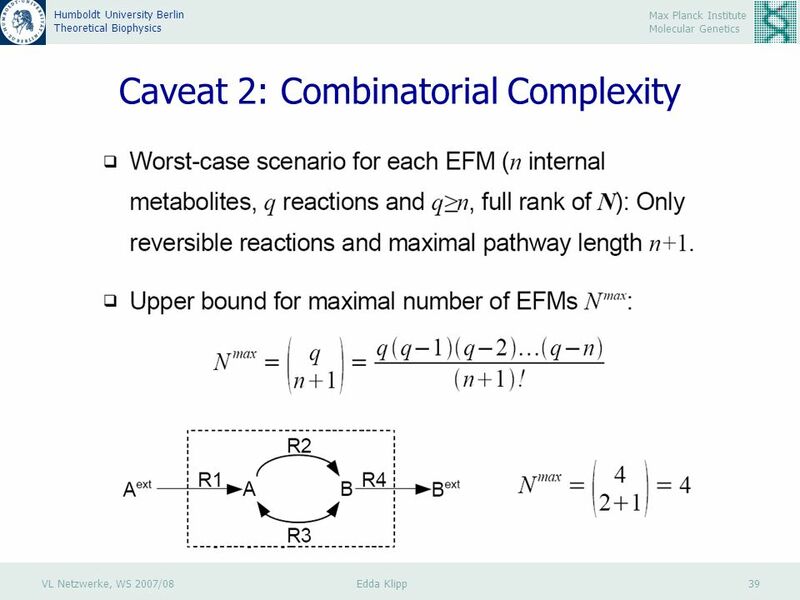 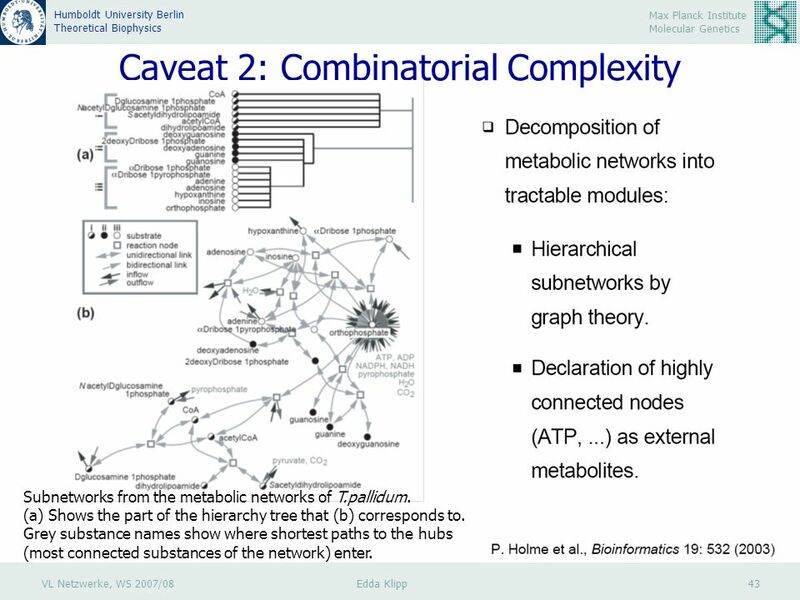 43 VL Netzwerke, WS 2007/08 Edda Klipp 43 Max Planck Institute Molecular Genetics Humboldt University Berlin Theoretical Biophysics Caveat 2: Combinatorial Complexity Subnetworks from the metabolic networks of T.pallidum. 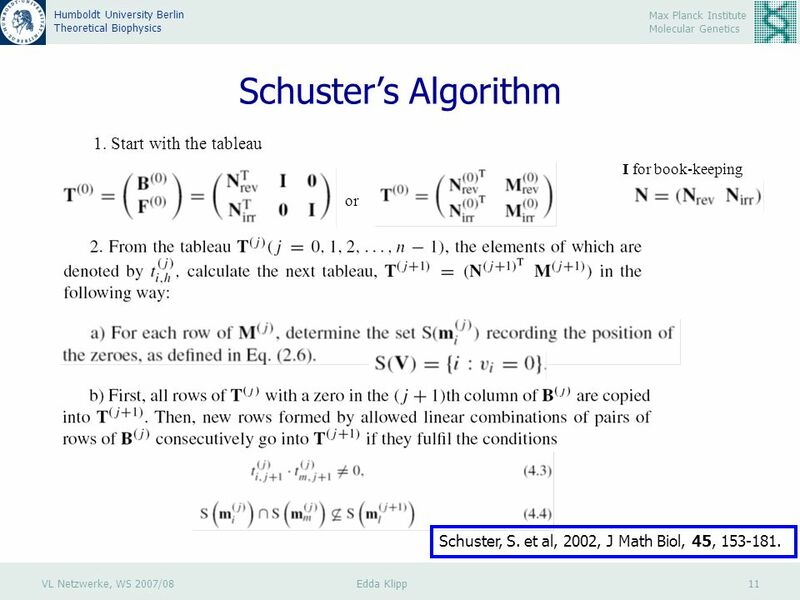 (a) Shows the part of the hierarchy tree that (b) corresponds to. 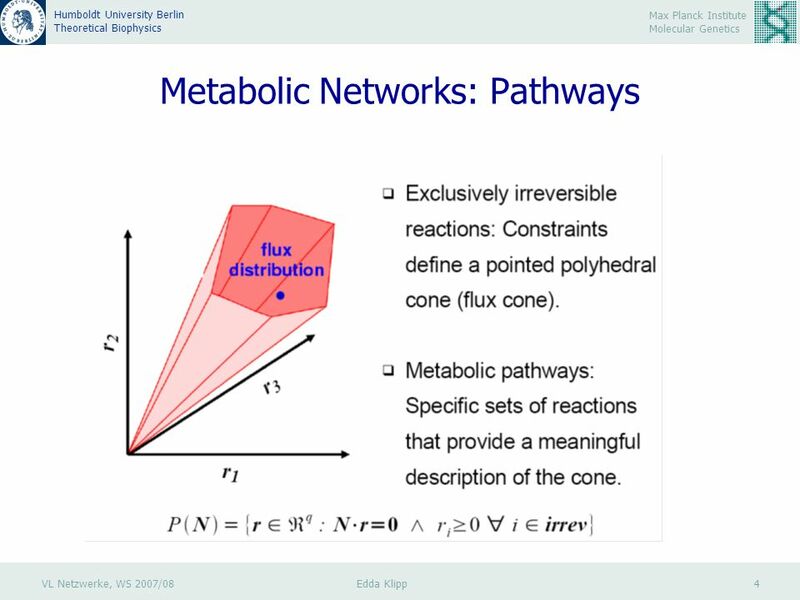 Grey substance names show where shortest paths to the hubs (most connected substances of the network) enter. 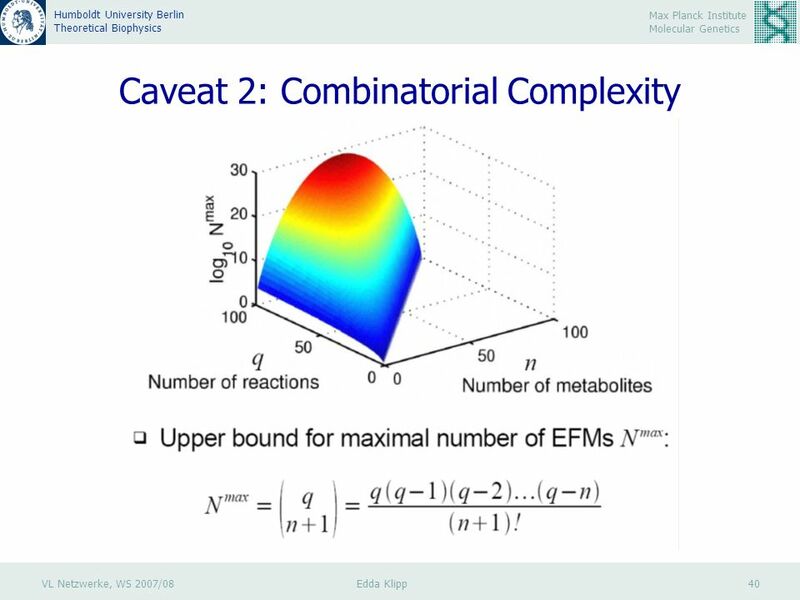 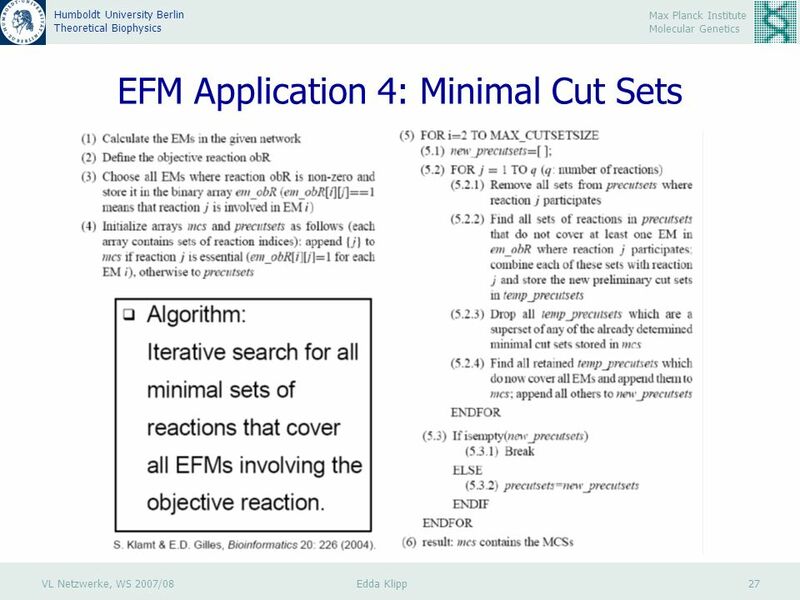 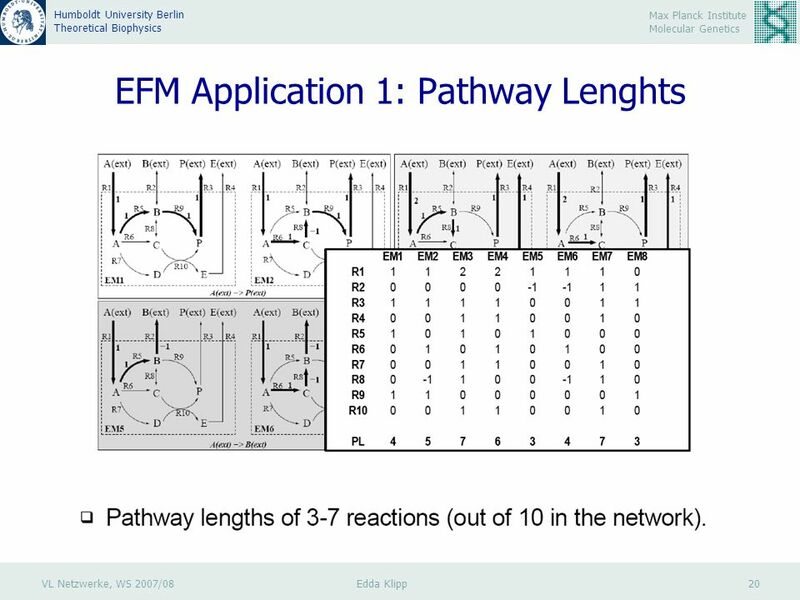 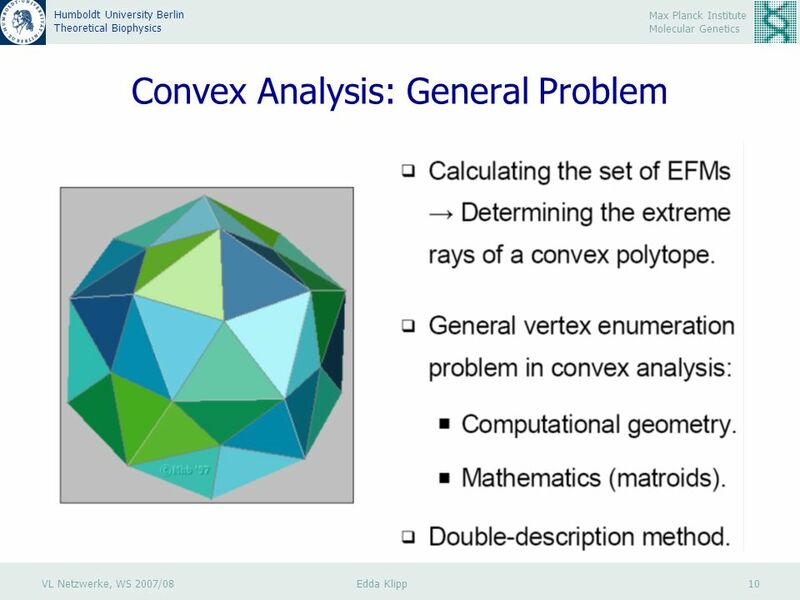 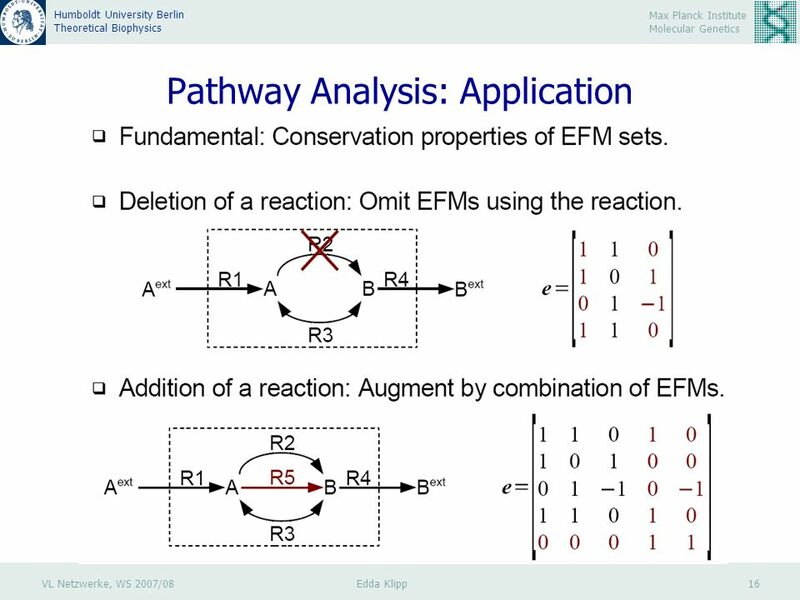 44 VL Netzwerke, WS 2007/08 Edda Klipp 44 Max Planck Institute Molecular Genetics Humboldt University Berlin Theoretical Biophysics Caveat 3: Feasibility of EFMs? 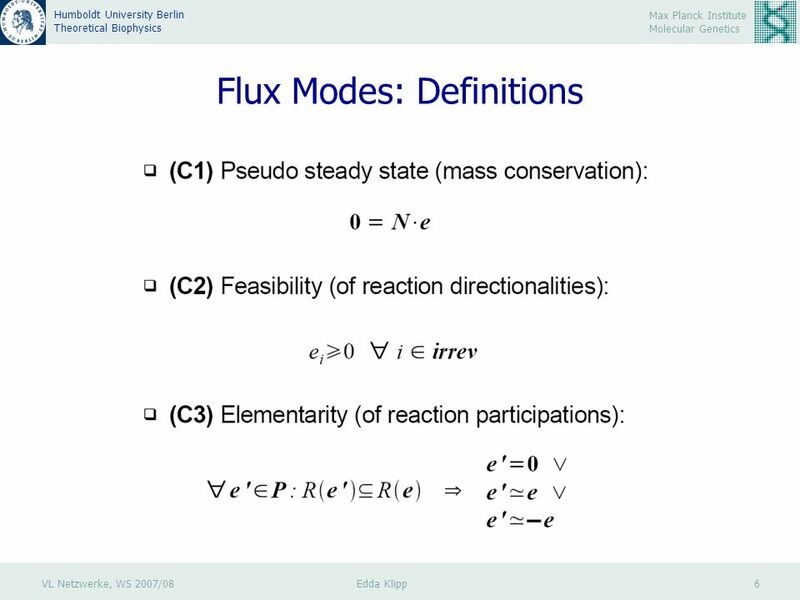 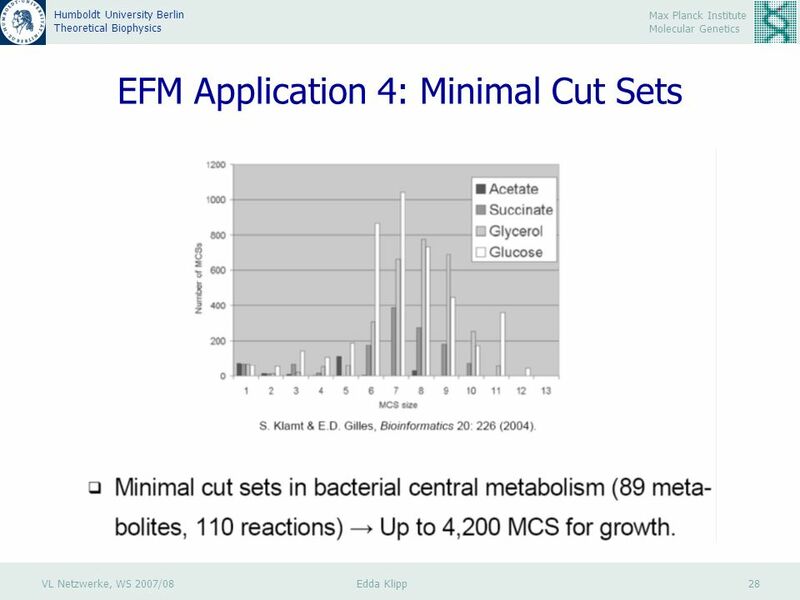 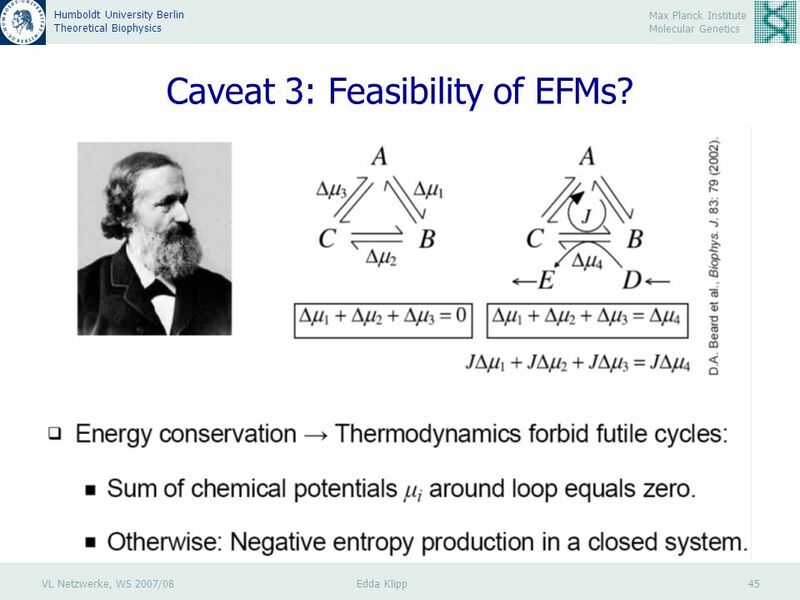 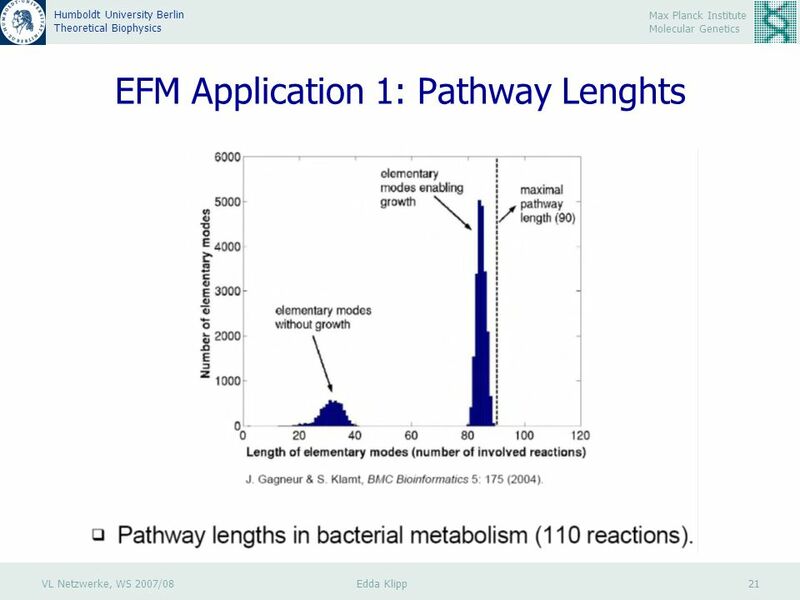 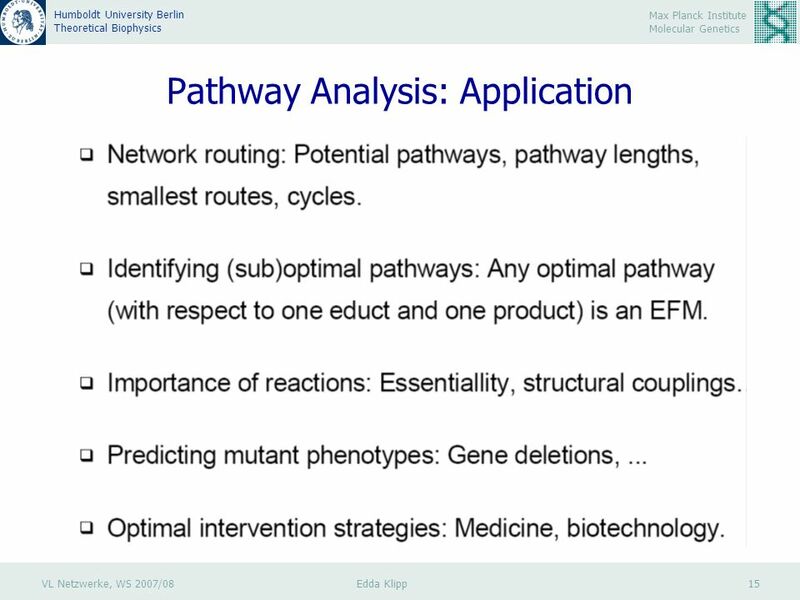 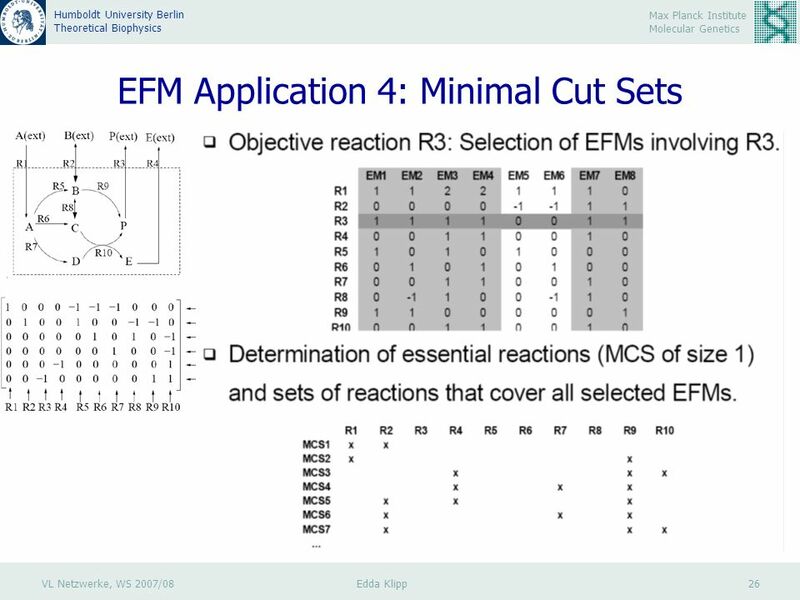 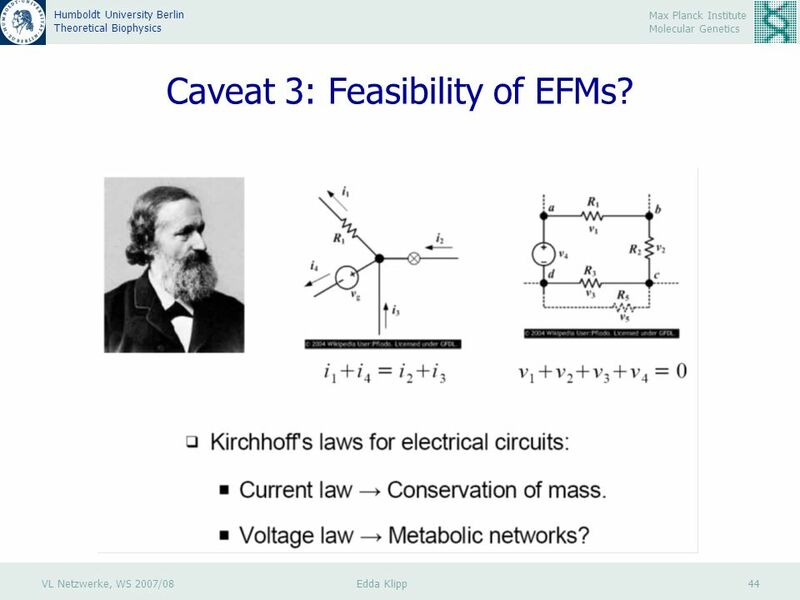 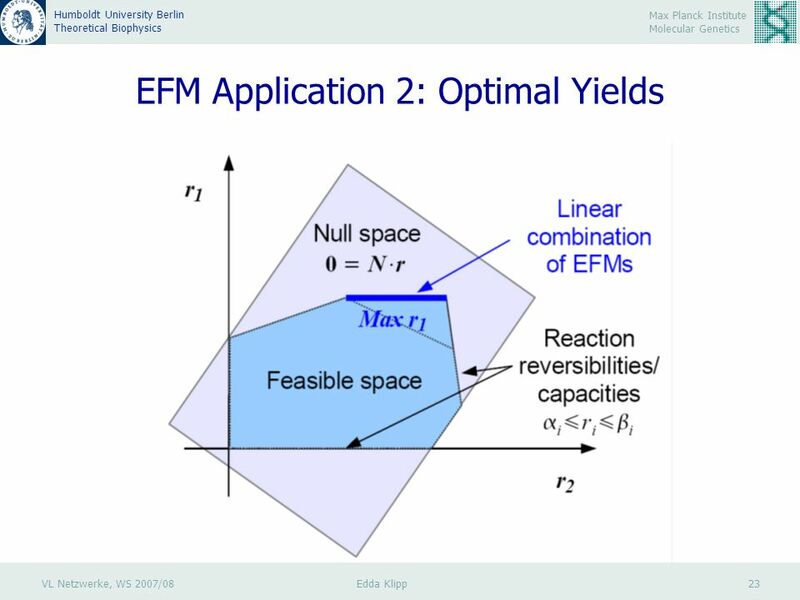 45 VL Netzwerke, WS 2007/08 Edda Klipp 45 Max Planck Institute Molecular Genetics Humboldt University Berlin Theoretical Biophysics Caveat 3: Feasibility of EFMs? 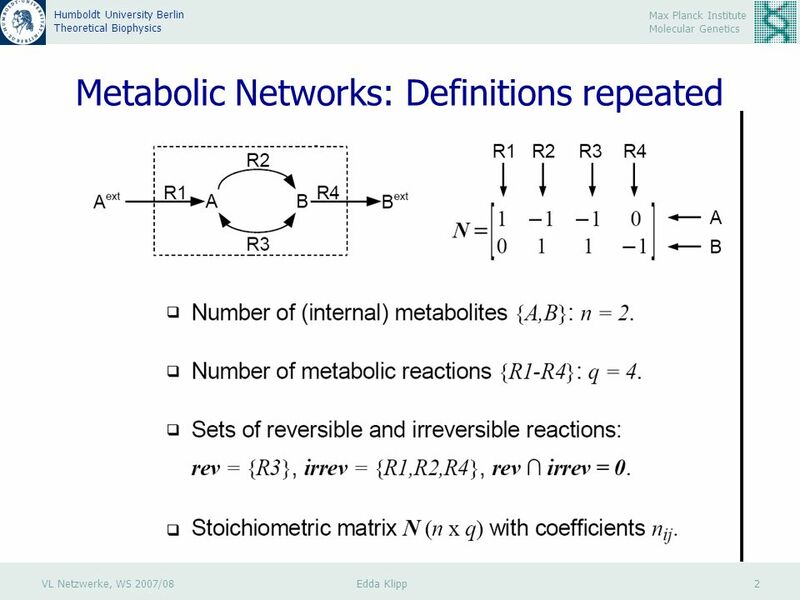 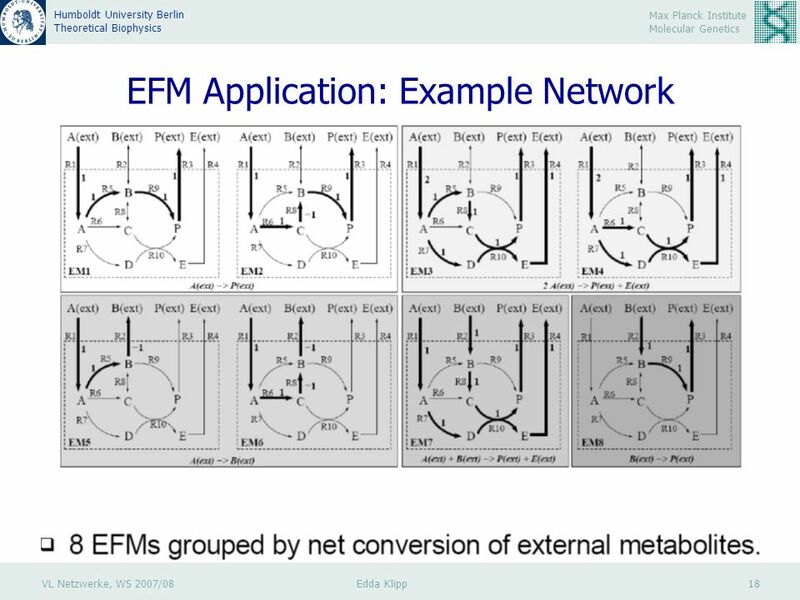 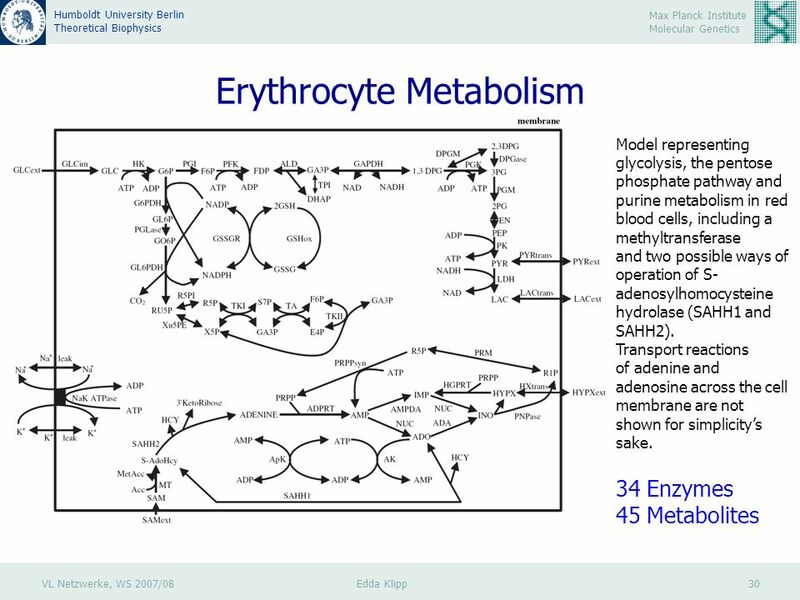 Download ppt "VL Netzwerke, WS 2007/08 Edda Klipp 1 Max Planck Institute Molecular Genetics Humboldt University Berlin Theoretical Biophysics Networks in Metabolism." 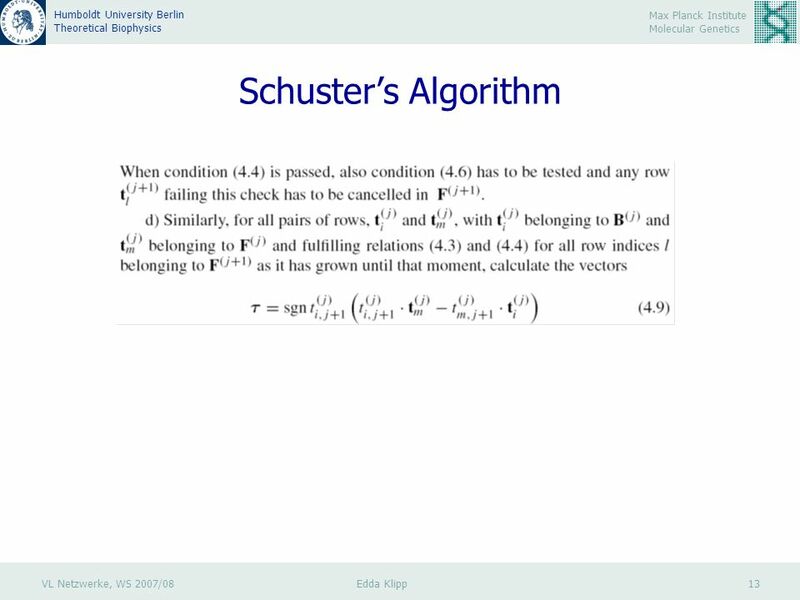 Chapter 3 Demand and Behavior in Markets. 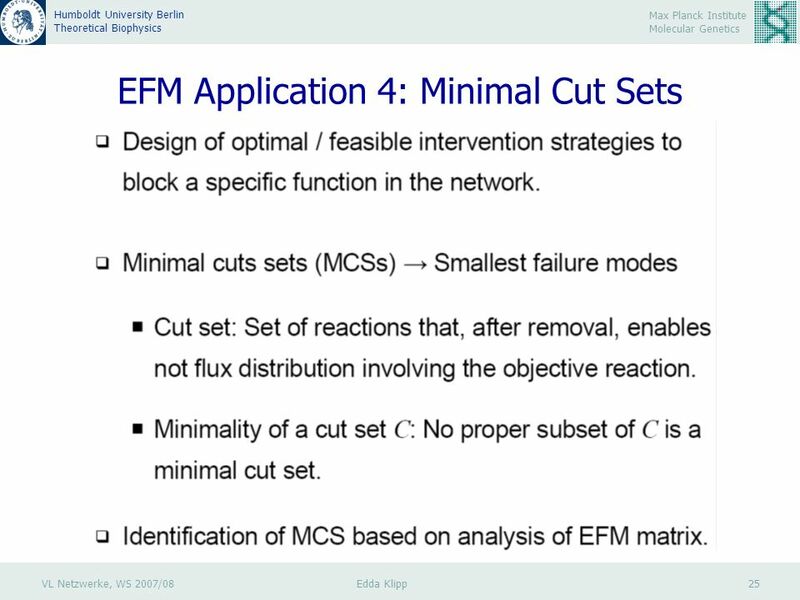 Copyright © 2001 Addison Wesley LongmanSlide 3- 2 Figure 3.1 Optimal Consumption Bundle.